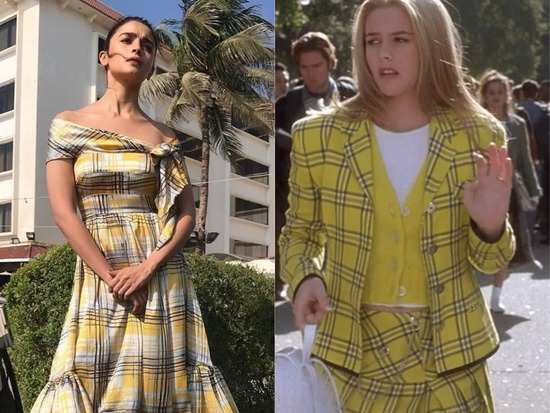 Alia Bhatt's yellow plaid dress by Silvia Tcherassi reminded us of the iconic yellow plaid co-ord skirt and blazer Alicia Silverstone wears in the movie Clueless. Bollywood actress Alia Bhatt may have joined the industry only a few years ago, but not has she made her presence felt as an actor but also as a style influencer. The 'Kalank' actress has been out and about promoting her film, and for every promotional activity, the actress has been actively choosing Indian or Indo-Western ensembles, much like her traditional on-screen character in the film, Roop. But much against her current state of mind, the actress stepped out in a beautiful, bright yellow dress – giving her shararas, anarkallis, kurtas, and sarees a miss. The actress’s yellow plaid dress by Silvia Tcherassi had a graceful off shoulder neck and a beautiful bow-knot detail. With a flared A-line skirt, the rest of the dress lay comfortably – making a perfect dress for the sweltering heat. As much as we loved the dress, its yellow plaid print reminded us of the iconic yellow plaid co-ord skirt and blazer Alicia Silverstone wears in the movie 'Clueless.' While Alicia’s Cher in the film doesn’t mind making an entrance and doesn’t mind the bright yellow hue all over, Alia’s look although similar from a long shot is much more wearable in reality. Alia’s kept her hair tied in a bun, her makeup fresh and minimal and her shoes in basic white – much like a real girl would. Overall, we love the look! Bookmarking this one too, just in case we’re getting invited to a high-tea party! In work front, Alia’s upcoming release along with Varun Dhawan, Aditya Roy Kapur, Madhuri Dixit, Sonakshi Sinha, and Sanjay Dutt, 'Kalank' is all set to release on the 17th of April. This will be followed by 'Bramhastra' in December, where Alia will be seen sharing screen space with her boyfriend and actor Ranbir Kapoor for the first time. A busy few years ahead for Miss Bhatt! 6Day 1 of Delhi Times Fashion Week was all kinds of glamour and fun! 8Sonam Kapoor slayed in white, *again*! 9Shilpa Shetty’s latest look is proof that Orange is *definitely* the new black! 10Sonam Kapoor’s opulent white ensemble has a personal detail you may have missed!